Why has a steadily increasing interest in the Beats emerged over the past four years? They've never entirely gone away, but I do not see young people championing their literature or emulating their rebellion. Grown children who still live with their parents do not seem true heirs to the Beats. If anything, the Beats have become caricatures in some respects, especially William S. Burroughs who, in all fairness, created his own, which had the effect of making him a cult figure. Yet in so doing he penetrated the popular culture more pervasively than the rest. David Cronenberg adapted Naked Lunch in 1991, a number of Burroughs's short stories have made it to film, he has been featured in character roles and cameo appearances in a number of movies, and IMDb lists no less than 37 appearances on screen as "Self." In 2002, Gary Walkow covered the life of Burroughs and his wife Joan Vollmer in Beat, and in 2010, Independent Lens did a documentary, William S. Burroughs: A Man Within. An earlier documentary by Lars Movin and Steen Møller Rasmussen, Words of Advice: William S. Burroughs on the Road, was released in 2007, and was awarded the Danish Film Institute's Roos Award. In 2010, Rob Epstein and Jeffrey Friedman's kinetic, exuberant, wonderful (with the exception of the misplaced animation) Howl blew through in a single week. Toward the close of 2012, Walter Salles brought Kerouac's On the Road to the screen. Michael Polish's Big Sur, adapted from Kerouac's novel, was released in October but has not met with the media blitz the biographical Kill Your Darlings has received. Stephen Holden gives Big Sur a glowing review, and it's a NYT Critics' Pick, but I have heard nary a peep about it at middle America's cineplex. 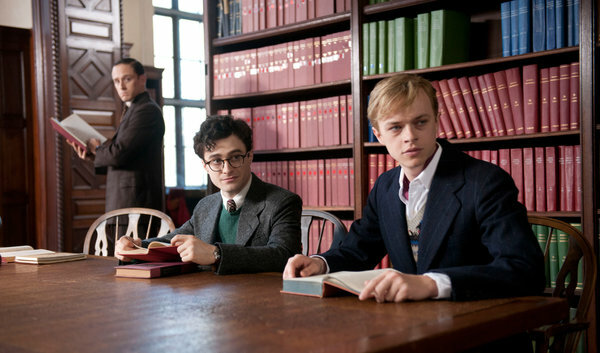 I contend that Hollywood's interest in the Kill Your Darlings true story stems not so much from the literary circle it involves as from the sensational nature of the episode, and Hollywood likes sensationalism. Now I come to find out that Steve Buscemi is directing Queer, a film based on Burroughs's first two novels, Junkie and Queer. Last year also saw the first production of Jack Kerouac's play The Beat Generation at the University of Massachusetts Lowell, the writer's hometown. The AP approached Todd Tietchen, an assistant English professor there, who said the renewed interest in Kerouac and the Beats comes because they "asked 'tough questions' about post-war society, consumerism and securing the American Dream through mortgages and auto payments.... '[Y]oung people now, as they deal with a challenging job market, are asking those questions.'" Hmmm... That may be a reason U Mass Lowell decided to stage the play, but it does not suggest a renewed interest in Kerouac, Ginsberg, Burroughs, et al. The Orlando Sentinel similarly proclaims that Salles's film "renews interest in Jack Kerouac." Young people are rightly distressed about the dearth of decent jobs, but that's not leading them to the Beats in droves, and it speaks to nothing literary. Maybe I don't know enough young people to judge the zeitgeist, but I am not seeing teens and twenty-somethings lolling around Starbucks reading Howl or On the Road or Naked Lunch. Rather, I believe the interest resides in the resonance this constellation of individuals had then and has now for the LGBT community. If so, it is the Beat Generation's non-conformity, their radical sexuality and rejection of received standards, not the literary experimentation and innovation, that this generation of those actively seeking gay civil rights embraces. "like the holders of a secret, [the homosexual community] had an advantage which was a disadvantage, too, and which was true of no other minority group in the United States. They were invisible. Unlike African Americans, women, Native Americans, Jews, the Irish, Italians, Asians, Hispanics, or any other cultural group which struggled for respect and equal rights, homosexuals had no physical or cultural markings, no language or dialect which could identify them to each other, or to anyone else ... But [the night of the Stonewall uprising], for the first time, the usual acquiescence turned into violent resistance...."
A familiarity with the Beats' writing was one way to make yourself known in '50s and '60s America. Even into the 1970s, high school and college students treasured tattered copies of On the Road. Today, a little more than a decade and a half after Ginsberg's and Burroughs's deaths, I would venture that simply knowing who they were is enough. It also seems to be enough to have driven a number of film makers to plumb this distinctive circle of renegades, though where Epstein and Friedman's Howl succeeds in getting at the words, On the Road and Kill Your Darlings fail. As is true of Australian film as well, the landscape participates as a dominant character in the American mythology: from the Hudson River School and the Luminists to Albert Bierstadt's paintings of the Western Expansion to Ansel Adams's photographs; from Nathaniel Hawthorne, James Fenimore Cooper, Thoreau, Willa Cather and William Faulkner to Cormac McCarthy and Louise Erdrich; from John Ford to Sam Peckinpah; from The Lone Ranger to Breaking Bad to the oeuvre of Ken Burns. In 1957, Jack Kerouac's On the Road codified the road genre, and Walter Salles's film gives ample shrift to the landscape. José Rivera's adaptation of the novel is reverant, but Kerouac's incantatory prose can't help but lose something in the translation from page to screen, and the reckless, rebellious, transcendence seekers don't quite make it into the theater. William Faulkner is attributed with saying, "In writing, you must kill all your darlings." However, Faulkner is paraphrasing Sir Arthur Quiller-Couch, the renowned British critic, scholar and educational reformer who published under the pen name Q. In a series of lectures published in 1916 as On the Art of Writing, in the final chapter "On Style" in an entry on "What Style Is Not," Quiller-Couch instructs, "Whenever you feel an impulse to perpetrate a piece of exceptionally fine writing, obey it – wholeheartedly – and delete it before sending your manuscripts to press. Murder your darlings." Get rid of those bits of writing you are most in love with because they are quite probably not at all as good as you believe. In all likelihood they are personal to you alone and will not translate to the reader. In John Krokidas's Kill Your Darlings, Professor Stevens (John Cullum) -- an amalgam of Lionel Trilling and Meyer Schapiro -- gives his students this same advice. But Kill Your Darlings is only marginally about the genesis of a literary revolution. Rather, what Quiller-Couch and Faulkner and Professor Stevens intend as a metaphor is literalized when the preyed upon Lucien Carr (in an exceptional performance from Dane LaHaan) turns on his sexual predator, the professor David Kammerer (Michael Hall). Daniel Radcliffe is an excellent young Ginsberg, and though I do not agree with A.O. Scott that Ben Foster and Jack Houston as Burroughs and Kerouac "are content with celebrity impersonation," I do believe that he provides a succinct critique of the film: "The freedom to abandon rhyme and polite diction becomes the vehicle and symbol for other kinds of freedom. Lucien’s mantra, 'First thought best thought' (which is the opposite of the writerly wisdom evoked in the film’s title), is an argument against repression in all its forms, even though Lucien himself cannot quite live by it."